Mmmmm I love lentils. With their strangely meaty flavor, they are a great addition to vegetarian cuisine...and they provide a filling and satisfying meal with this recipe. 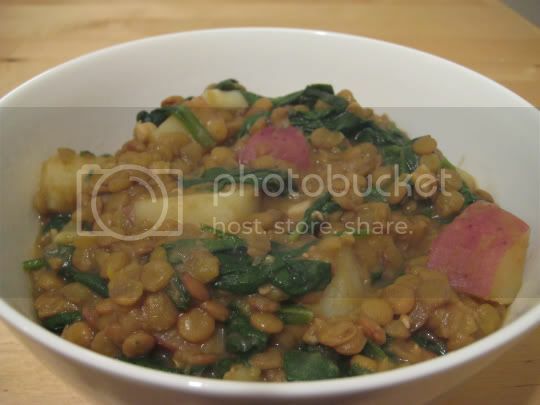 Brown lentils (which are pretty standard and probably the most widely available) are cooked in vegetable stock with garlic, red potatoes, spinach, and lemon juice and zest. The lemon in the recipe adds a nice tanginess, but I still needed to add some salt (1/2 teaspoon) for flavor. A bit of cayenne is also added, which adds just enough heat in the background. The recipe calls for fresh chopped mint to be added in the end, which I thought was unnecessary and added an odd flavor. Fresh oregano or thyme would have been better with the earthy, rich flavor of the lentils. This was very thick, and was really just a dish of lentils, not a true stew. Still, the flavor was great, the meal was hearty, and leftovers fared very well. A dish high in fiber and protein and low in fat is always good too. Make again? Yes, without the mint.